Growing up in the Middle East, dates were (and are!) everywhere. You ate them almost throughout the year – either on their own or as an ingredient in stews or puddings. Whenever you went to someone’s house, there was usually a plateful to greet you. So you had to have liked dates! Luckily we did (and do!) and have been trying since then to figure out the perfect date cake recipe. A properly smooth date cake – not a cake with dates, we want a whole lot of date in every mouthful. Recently, we tried a beautiful version of date cake on a trip to the Nordic Bakery in London and it was exactly that – a lovely dark brown, soft cake – not too sweet – and perfect with coffee. So, as we like a challenge, we were inspired and thought we’d come up with our own! Now, as a mini confession, we’re not a big fan of orange-flavoured anything (apart from oranges of course) and certainly not marmalade, but this totally works. 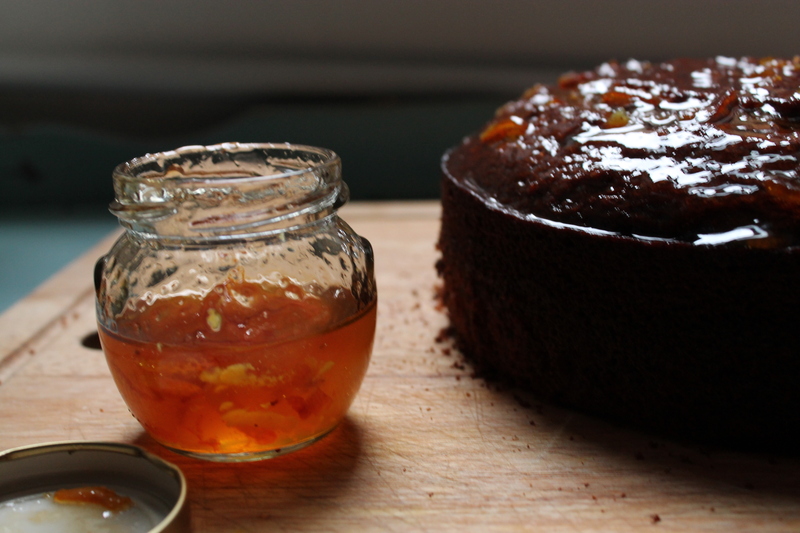 The tangy marmalade is a perfect accompaniment to the sweetness and spiciness of the cake mixture – so if you’re like us, definitely go for it. Don’t even hesitate! Note: this recipe calls for what our mother calls the “boil and bake method” – which she used to employ whenever making Delia Smith’s Sticky Date Cake in the 90s/early 2000s. The Delia method is definitely a winner whenever you’re working with dates! Preheat the oven to 170C (fan assisted). In a non-stick pan, bring the dates, water and jam to boil, then lower to a simmer. Stir once in a while, mashing the dates as you go. Once you have a sort of thick paste after 10 minutes, take the pan off the heat and leave to cool. In a mixing bowl, cream the butter and sugars together. Add the cooled date mixture. Add the flour, baking soda and cinnamon and mix until incorporated. Finally, add the eggs and mix until incorporated. 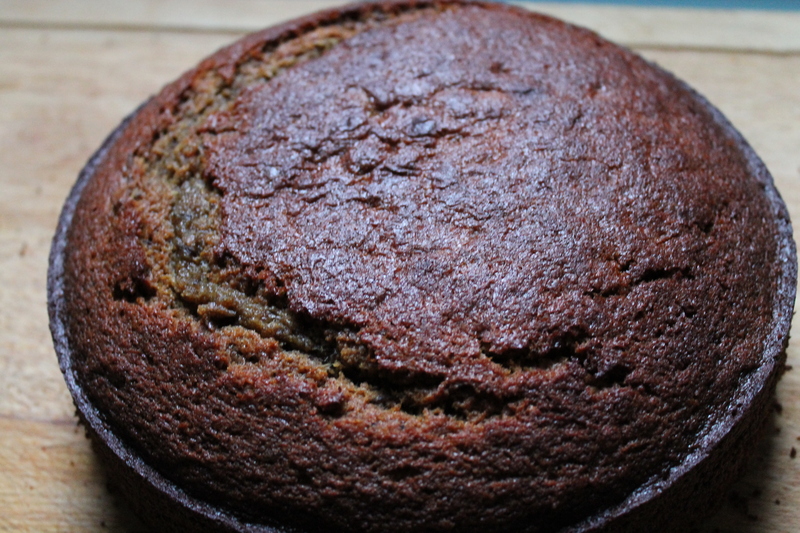 Pour the mixture into a lined 20cm baking tin – it’s a good idea to use a deep tin as this cake will rise! Our is about 7cm deep. Bake for 30 minutes until golden. Then lower the heat 10 degrees to 160C (fan assisted) and bake for a further 30 minutes until a skewer inserted into the middle comes out almost clean. You want a few crumbs sticking to the skewer so that it’s moist (read: not dry!). If you feel the cake is browning too quickly and the middle is still wet, cover with foil and continue to bake until it passes the skewer test, checking every 5 minutes. Cool in the tin for 10 minutes and then tip out onto a cooling rack. 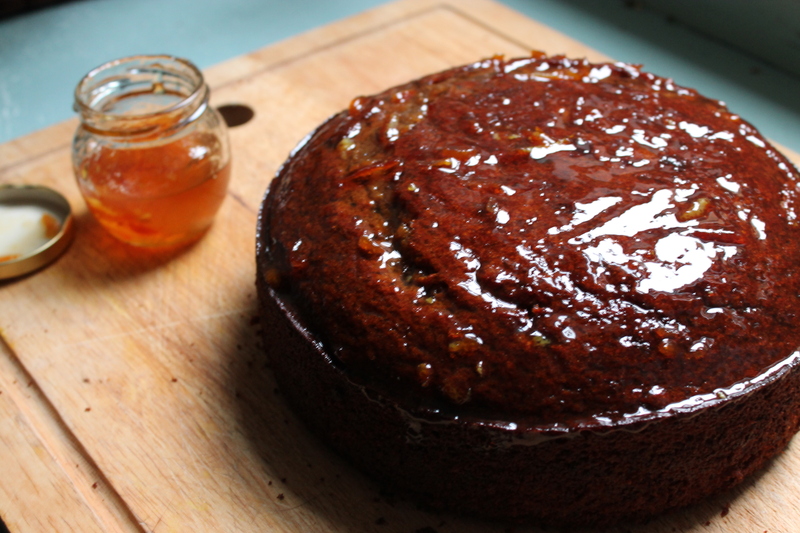 Glaze the cake with the marmalade. If the marmalade you’re using is thick and hard to spread, “loosen” it by heating in a non-stick pan. Enjoy immediately or keep in an airtight tin for maximum 3 days. Nice flavour, followed instructions to the letter but not cooked in the middle. Thanks for your feedback Lesley! Unfortunately oven temperatures can vary so we will amend the recipe to take this into account. However, as a rule of thumb, cakes should be baked until a skewer inserted into the middle of the cake comes out almost clean. If you think the cake is browning too quickly, you can cover it with foil and continue to bake. I hope this helps and trying out our recipe! I was looking for a marmalade cake recipe and came across yours and as soon as I saw the date mix knew I had to bake it. I tweaked it a bit and thought you might like to know what I did? I had some home made fig jam so used that with the dates and also added a tsp vanilla extract and a scant tsp orange extract once the dates had cooked down. To the cake I added 50 g toasted walnuts as I love nuts in a cake and thought it would be nice for the texture. For the topping I mixed half marmalade and half runny honey then added a handful of toasted walnuts whilst hot to soften the mix. Spread over the still warm cake and have to say thought the finished cake looked lovely. The topping so finished it off and it tasted yummy!! I am so glad I found your recipe as it has given me ideas for using other fruits too, apricots with apricot jam for certain, even a mix of apricots and dates maybe? I too love baking and often look at different blogs for inspiration and certainly wasn’t disappointed at finding yours!! Thank you so much Sandra! I love your tweaks and I agree, nuts in a cake makes the texture more interesting. Apricots would be really lovely – you could also experiment with spices!